Matt Lee asks State Dept. spokeswoman why Washington "lets it slide" when Khamenei accepts "death to America" chants. Matt Lee of The Associated Press, who is known for his uncanny ability to ask the tough questions during State Department press briefings, was at it again on Tuesday. 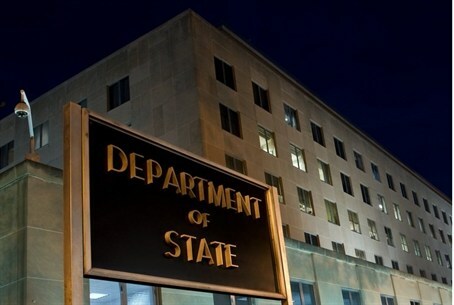 Several days after calling out the State Department over its series of condolence messages to Iran following the death of President Hassan Rouhani's mother, Lee grilled spokeswoman Jen Psaki about Washington’s attitude towards Iran’s Supreme Leader Ali Khamenei. Lee asked Psaki why the United States is letting it slide when Khamenei agrees with the “death to America” slogan during a rally in Tehran, while refusing to accept Prime Minister Binyamin Netanyahu’s clarification about things he said about a Palestinian state before the election. Lee: Okay. And then this has been raised before by other people, but I’ll ask it again now in this same context: When the Supreme Leader of Iran is continuing – in the middle of these negotiations is continuing to make statements like “death to America,” how is that not problematic for you? How is that not something – why are you just willing to let that – let it slide, basically, and you are holding the prime minister of Israel to comments that he made and has since changed? Lee: Well, the Iranians can be trusted and the Israelis can’t? Lee: Is that what you mean? Psaki: No. I’m actually trying to convey that our relationship with Israel is abiding; it’s strong; it’s a security relationship; it’s one that we’re committed to. Do we have disagreements on some issues, like how we should proceed with preventing Iran from acquiring a nuclear weapon? Yes. Have we – can we – do we believe that it isn’t possible to just forget what the prime minister says when it’s conflicting with past precedent and past policy for some time? Yes. But obviously, we’re continuing our discussions. The Secretary has been in touch with Prime Minister Netanyahu. We remain committed to our relationship. Remember, we’re not evaluating our relationship with Israel. We’re evaluating how to proceed as it relates to pursuing a two-state solution. Psaki: And remains, and will be even if there’s a deal. Lee: Right. And yet you’re willing to take – you’re willing to let his words slide, but not that of a country with which you say you have this great security relationship. Psaki: No, I would disagree with that. I would say, one, as a reminder, even if there is a deal with Iran, it doesn’t mean we let slide or forget, whether it’s the comments, the – or more importantly the actions, state sponsorship of terrorism, their human rights record, the fact that they’re holding American citizens – they remain – they continue to hold American citizens, including a Washington Post reporter in their jails. I mean, these are all issues that we remain very concerned about. Those concerns are not going to be soothed by a deal. But we also feel that preventing Iran from acquiring a nuclear weapon is not only in our interests, it’s in the interests of the international community, and that’s why we’re pursuing it. It’s not about trust.